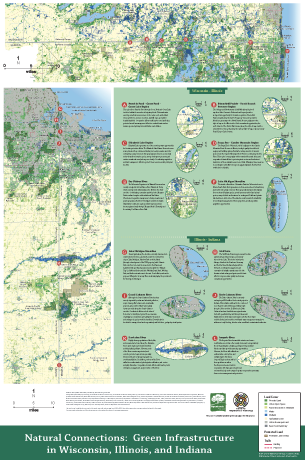 In October 2000, Openlands convened a conference to address natural resource protection in the tri-state region (northeastern Illinois, northwestern Indiana, and southeastern Wisconsin). The conference’s objectives were to identify the green infrastructure that connects the three states, assess the threats to these resources and the status of efforts to protect them, and define an agenda for the future. In preparing for the conference, Openlands was unable to locate a map of the three-state region that showed its green infrastructure. Moreover, Openlands found that most available information about the extent, nature, and health of the region’s green infrastructure stops at the county or state border. Conference participants identified obstacles to protecting natural resources that cross state lines and strategies for overcoming them. The conference attendees agreed that lack of information about natural resources across jurisdictional lines was a major obstacle to cooperative efforts to protect the resources. For example, naturalists in the Chicago Wilderness region seeking to assess the amount and quality of habitat for grassland birds know that vegetation and land use data are inconsistent from county to county, much less state to state. Lack of information about wetlands in Wisconsin initially hindered efforts by the Liberty Prairie Conservancy to increase flood absorption capacity along the Des Plaines River. Everyone at the October 2000 conference agreed that one of the most important ways to help interstate and regional conservation efforts would be to create a map and regional database that provide foundational information on green infrastructure across the three-state region. At the same time, CNT was developing a state-of-the-art geographic information and analysis division, mostly focused on transportation, energy, and housing. The Geographic Research and Information Division (GRID), as it came to be called, is the largest public interest geographic information system (GIS) group in the Midwest and has been integral to advancing CNT’s mission. The intellectual and analytical capacity of GRID made possible both the groundbreaking analysis CNT performed to establish the Location Efficient Mortgage (LEM) and the analysis of the electricity market that resulted in the development of the Community Energy Cooperative. The foundation of CNT’s geographic analysis is a strong commitment to open access to data and information. In 2002, CNT and Openlands formed a partnership to address the need for better information about the green infrastructure in the 14-county region. CNT and Openlands identified five teams of “green infrastructure experts” in Wisconsin, Illinois, and Indiana to provide technical advice and overall guidance for the project. We also convened an informal group of advisors selected from interested groups in other parts of the larger Great Lakes region that either have implemented similar mapping projects on a smaller scale or were interested in replicating this project. We compiled the best available data in the region, collecting data from more than 60 local, state, and federal agencies, as well as private land trusts and conservation groups. Collectively, the green infrastructure detailed on the map represents more than 175 layers of data. Because different agencies collect their data at different scales and projection levels, we had to normalize all of it to a uniform projection and scale—a task that had never been done before. The layers include publicly owned lands, existing and proposed greenways, waterways, trails, and other natural areas and open spaces. Selected highways, towns, and state and county borders are also included for reference purposes. A data matrix can be found here. they include some of the richest varieties of valuable dune, prairie, savanna, wetland, and forested ecosystem types in the Midwest. 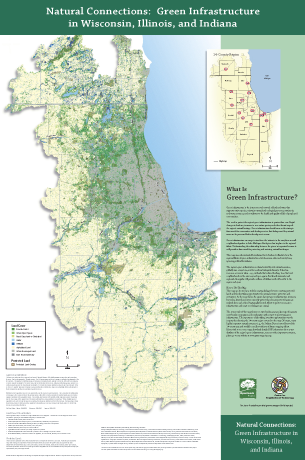 The front of the map is view of the green infrastructure in 14 counties in Wisconsin, Illinois and Indiana. While the map shows the abundance of the region’s outstanding natural resources, it also makes clear that only a limited amount has been protected. The back of the map identifies the most promising opportunities for bi-state cooperation, highlighting important resources that lie along the Wisconsin-Illinois and the Indiana-Illinois borders. It makes specific recommendations for protecting and managing these resources through cross-border coordination. A data archive that allows users throughout the region to easily access the information developed during this project. Users can download most of the data collected (some data is protected by confidentiality agreements) and obtain information on how to use green infrastructure to improve their communities. A “State of the Data” Report that identifies each data set collected, as well as data gaps and opportunities for better regional collaboration to address those gaps. Links to the network of partner organizations who assisted us in identifying data sources and helped shape the project so that it would be as useful as possible to the end user. These partners, located across the 14 counties, as well as the Great Lakes region and the nation, can share information and use the data collected to improve decision-making. Their input was and contains to be invaluable. Creating an interactive database where users can view and download the data and create customized maps for their issue or geographical interest. Digitizing key data sets that would help regional decision-makers. Working with similar efforts across the country to address long-term sustainability issues.